CHICHESTER athletes turned in some sterling performances in the 100-mile South Downs Relay. The event is run by teams of six, with each member running three legs of between four and eight miles. Sunshine and a strong breeze from the west made this year’s race even tougher than usual, but the three Chichester teams were up to the challenge and finished with some excellent times. For the ladies, Katherine Bond and Anneliese Shaw were joined by newcomers Megs Crabtree, Nicky Hill, Linda Roberts and Anne Vaudry. They finished in an excellent fifth place in 13hr 21min in a much stronger field than usual in which there was at least one international. 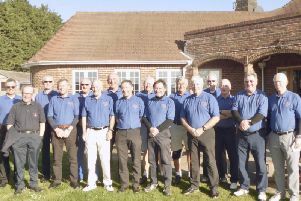 In the men’s A race, captain Keith Akerman headed a strong side also comprising Mark Jennings, Mike Moorcroft, Nick Palmer, Charles Rodmell and newcomer Alex Smith. They finished 13th in a highly-respectable time of 12.24.28, just 14 seconds behind a strong Hailsham Harriers squad. In the men’s B race, Chichester B’s line-up was made up of the evergreen Tom Blaylock, Tony Cooley, David Dorning and Rob Wiggins, joined by relative youngsters Gary Williams and Andy Wingham. They were delighted to finish sixth in 13.18.44 – but their joy was tempered by the knowledge they had missed out on fifth place by just two seconds – incredible after 100 miles of running. The marshals at the changeovers play a key role in the smooth running of the race and thanks went to the Chichester team at Littleton Farm – , Sue Barty, George Cooley, Angus Farrelly, Jan Hill, Kevin Lockyear, Tracy Lockyear, Jill Renson (chief marshal), Alan Rowley and Carla Wood. Team support also came from Dave Barty and Colin Harley. They finished in an excellent fifth place in 13hr 21min in a much stronger field than usual in which there was at least one international.